We had started off from Hyderabad early around 6 in the morning to avoid the city traffic. The drive from Hyderabad towards Bidar on NH-9 was uneventful with good roads and no traffic. The only confusion we had was where we needed to get out of the NH and take the right towards Bidar near Zaheerabad. We could not locate the turn, and went a bit ahead. Cursing the lack of road signs, we had to drive back some distance to catch the right turn again. The road from the NH towards Bidar was not as great, but drivable. The name Bidar appears to be derived from the Kannada word for bamboo - bidiru (might have had lots of bamboo trees in the past). 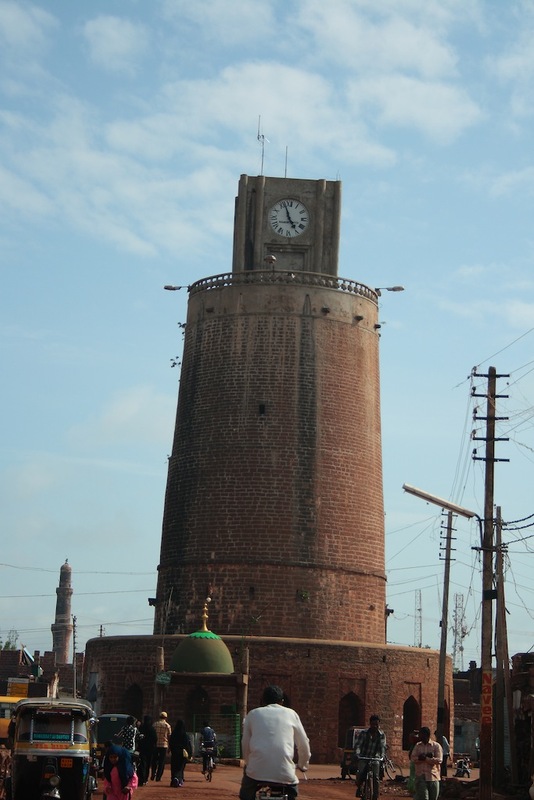 Bidar is a small town with lots of history. 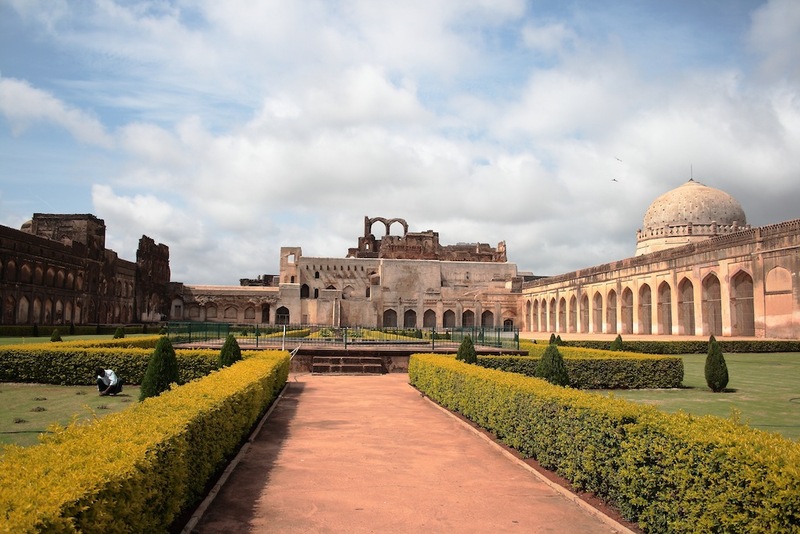 Bidar, if you notice on the map, is right at the center of the deccan region. It also apparently had a mildly better climate than the surrounding region, which is why rulers preferred to make it their capital during those times. Most of the visible history today is from the period of the Bahamani rulers. 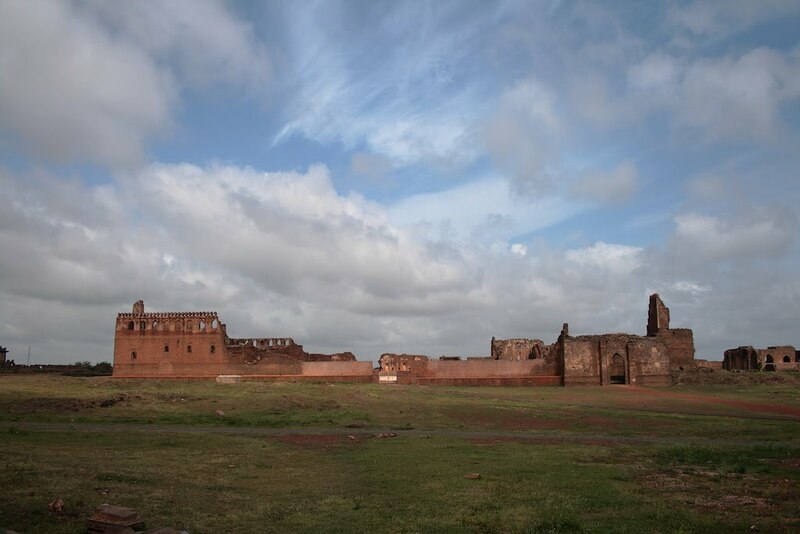 Being at the seat of power, Bidar has seen a lot of war and bloodbath. You can feel that as you enter the city through fortress like walls with massive iron doors. The entry path towards the door is narrow and curved, constructed so as to prevent the use of logs or charging elephants to break down the door. As you drive through the curved narrow entrance, watch out for any large trucks that might be coming from the opposite side. We had to back off to allow a lorry from the opposite side to pass before we could. As you drive in to the city, the first monument that can be seen is the Chaubara. In the olden days it served as a watch post for the troops and a place to make announcements, and was later converted to a clock tower. At the crossing of four major roads, the place is very dusty, noisy and crowded. We didn't feel like stopping to have a closer look. Probably early morning is a good time to explore the Chaubara in detail. Nearby to the Chaubara is the Mohammed Gawan Madrasa (school). Mohammad Gawan was a Persian scholar who arrived at Bidar during the Bahamani period. He quickly became the favorite of the Bahamani Kings and the people through his knowledge and reforms. He was responsible for getter Bidar to be recognized as a seat of knowledge. Clad with beautiful blue persian tiles, engraved with writings of the holy Koran and flanked by two minars, the Mohammed Gawan madrasa must have been a treat to the eyes in those days. It still is an awe inspiring structure today, despite having decayed with time. One of the two minars has been destroyed completely by lightening. 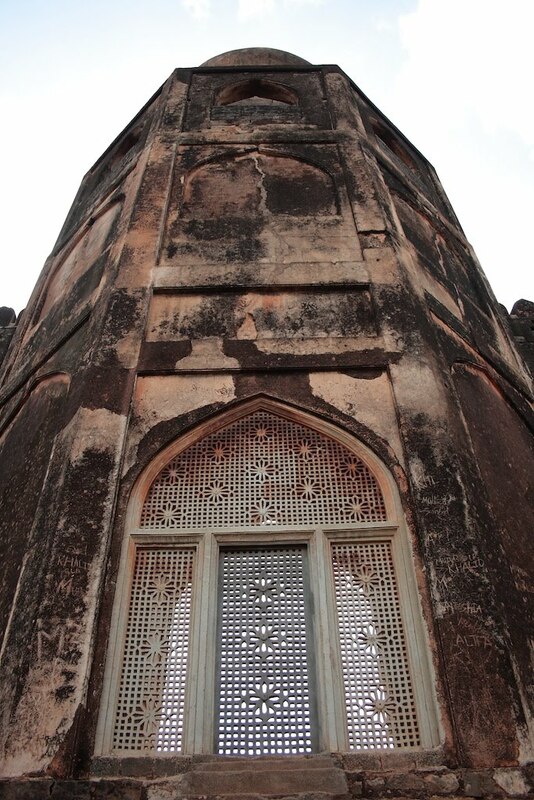 But we could still see small portions of the blue tile sticking to the surviving minar. History says that the local leaders were jealous of Mohammed Gawan and got him executed by the King by deceit. They apparently stole Gawan's official seal, wrote a letter of treachery to a neighboring kingdom with his seal, and let the letter fall in to the hands of the drunk king. The king, in his drunken state, ordered an immediate execution of Gawan. The king realized his mistake when he became sober, but I wonder what he did to the culprits. The article was quiet about this. 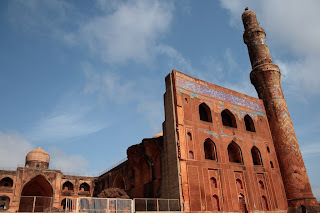 From the madrasa, we then moved towards the Bidar fort. 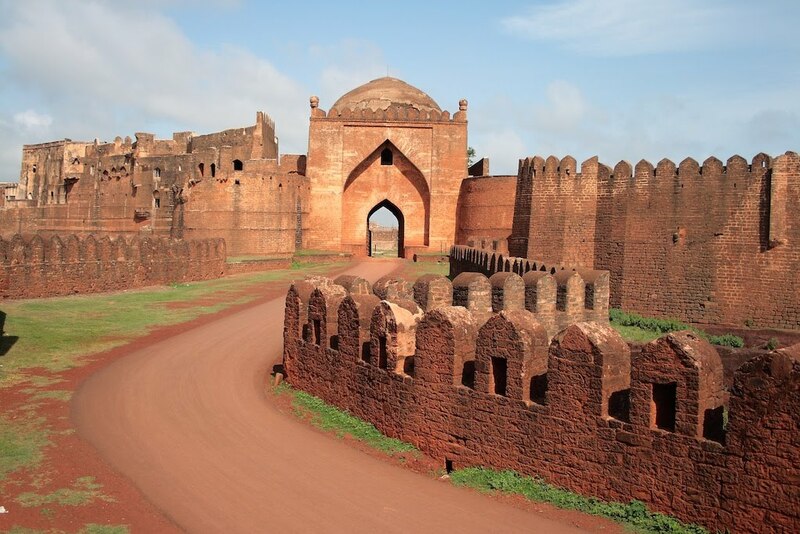 The Bidar fort was built by the Bahamani sultan Alla-Ud-Din when he shifted his capital from Gulbarga to Bidar. Spread over a large area, it is surrounded by huge walls and a deep moat. One can see remnants of the same blue persian tiles at the fort gates. There are a total of seven gates for the fort. Out of the main building, we drove around the fort area, visiting various isolated ruins around. Most of the ruins were out of bounds and locked with chains, probably to prevent antisocial elements from using them as hideouts (quite possible in the vast lonely stretch of land). Looking at the scale of things around, we felt it must have been a very impressive place in the past. 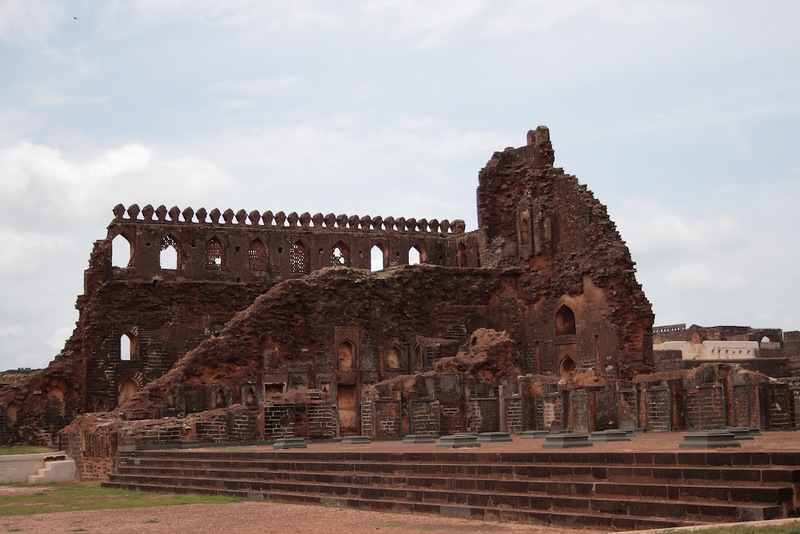 Certain places inside the Bidar fort have a unique mud which has been used traditionally to make beautiful black carved metalwork known as Bidriware. The manufacture of Bidriware is a pretty interesting process that involves the use of a combination of a certain alloy and silver. The chemicals in this special mud darken the alloy to a gleaming black color while silver is inert to it. This results in the striking black and white contrast of typical Bidiri metal work. We didn't have time enough to learn more about it, but there are some craft villages around that you can visit. 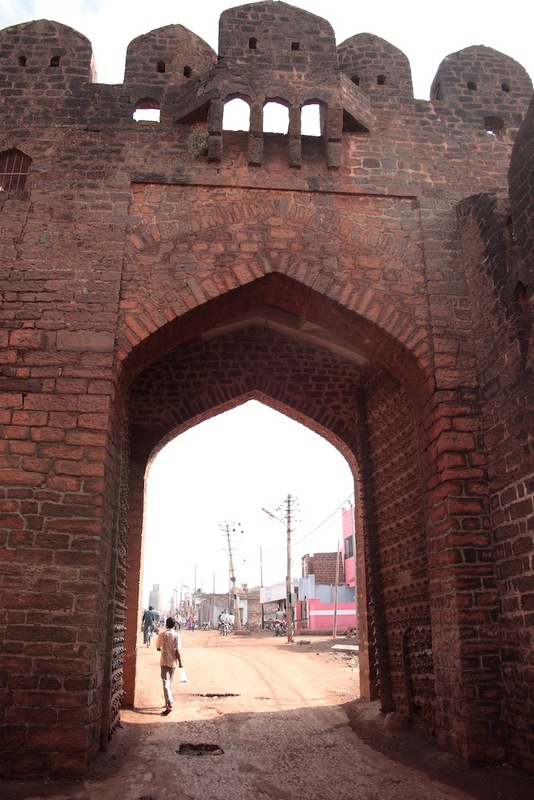 If you are visiting Bidar, do read up about it and arrange for a trip to see the craftsmen at work. 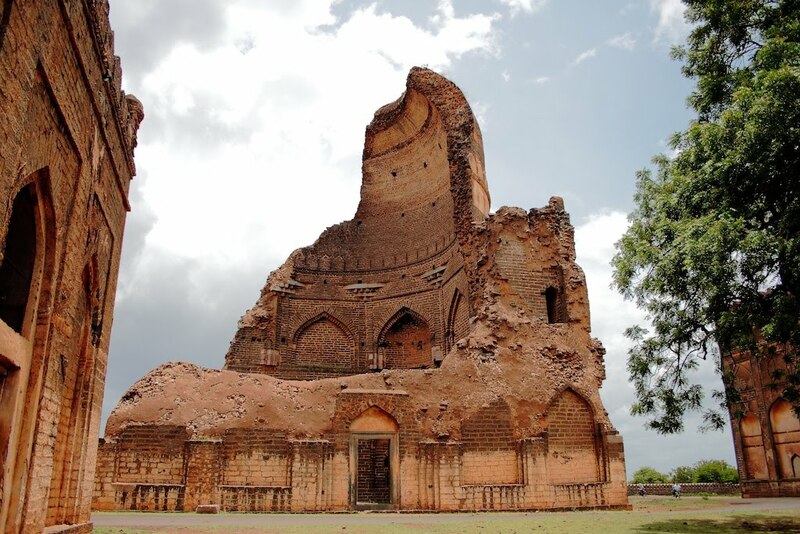 Near to Bidar fort lies the tombs of the Bahamani sultans. The first one that we saw as we drove towards it is a short white octagonal tomb - a pretty unusual sight. This is the tomb (locally known as the Chaukhandi) of Hazrat Khalil Ullah. He was the spiritual advisor of the then sultan. Driving further down led us towards a row of 5-6 more tombs. They were huge (mostly... with some small ones too) and some of them were in ruins. 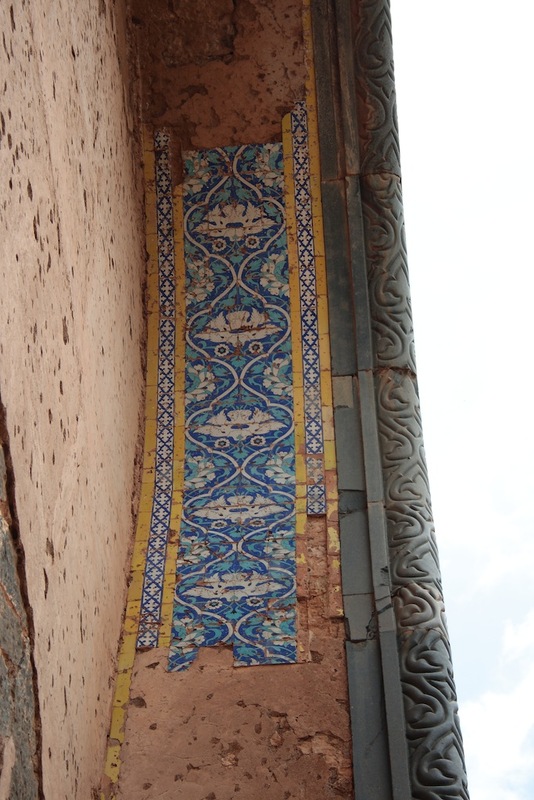 We could still see remnants of the same bright blue persian tiles on the walls. 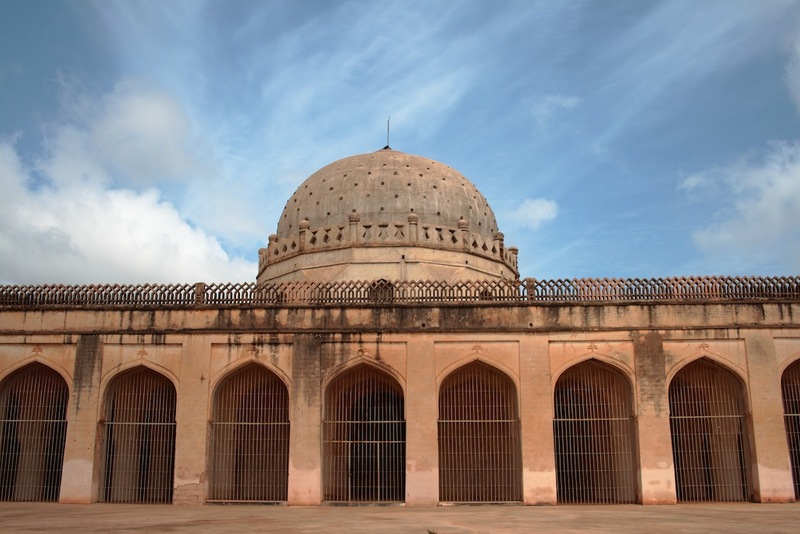 There was one tomb (of Humayun Bahamani, the 11th sultan) that had half of its dome broken open. It was initially surprising that the tomb of later sultans - the 17th and 18th were much smaller that those of their predecessors. But when we came to know that they were the last of the Bahamanis, it was not surprising any more. That reflected the state of the empire when it was falling down. If you want to identify the tomb of each sultan, they are at this (strangely .jp) site. 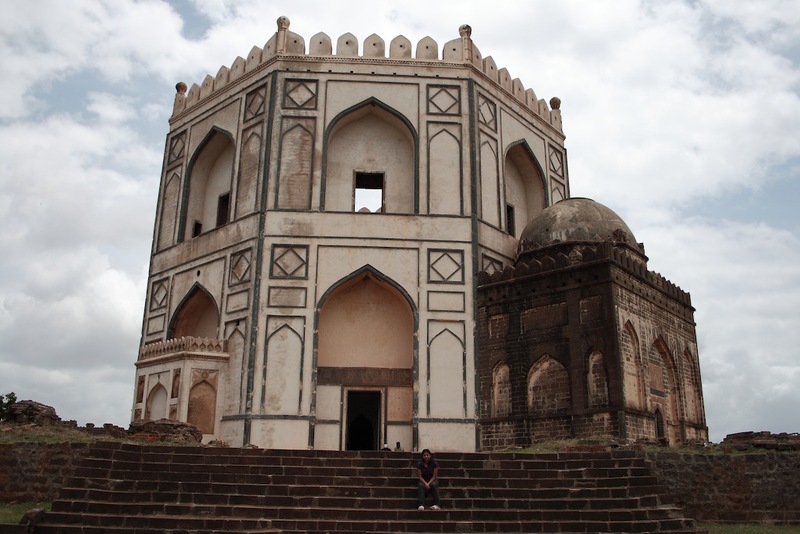 We did not find a good place to stay at Bidar, so we decided to move on towards Gulbarga and Bijapur the same day. There were a couple of places we missed seeing at Bidar because of that - the most prominent of it being the Gurudwara of Nanak Jhira. Above is the google map marked with the places of our interest in Bidar. Zoom in at each place to get an overview of the layout of the place. When we started for Gulbarga around 3 in the afternoon, the effect of the light lunch we had at Bidar fort was already wearing out and we were hungry. We were hurrying to reach either Gulbarga or Bijapur before late evening so as to have some food and find a decent place to stay. Back to "A Trip Down Memory Lane"
Well written...I am from Bidar and feel good when people visiting Bidar complement through their travelogues. @Niranjan Sheelavant: Thanks! There's so much to see and learn from this place. I've probably just touched the surface. I'm glad that you liked this article. Thanks for your views and tips! Nice to see detailed article about my native, Thanks Tanmay....Regret to say you missed few wonderful places in Bidar viz., world famour Guru Nanak Jhira, Narasimha Jhira & Paapanashi. These are very unique places!!!! Hi Sagar, indeed I have missed those. And they are definitely nice places. I'll try to visit them next time I'm in Bidar. Thanks for your comments!